This is what happens when it’s fall: you break out your tall, brown boots. You buy that army green vest you’ve been eyeing at the Gap for a while, hoping maybe the Husband might just spring it on you but then you get the coupon in the mail, and oh, whoops, I’ve just conveniently bought it for myself. You get overly excited about the fact that you can now turn off the air conditioning, open the windows, and stick it to Pepco. 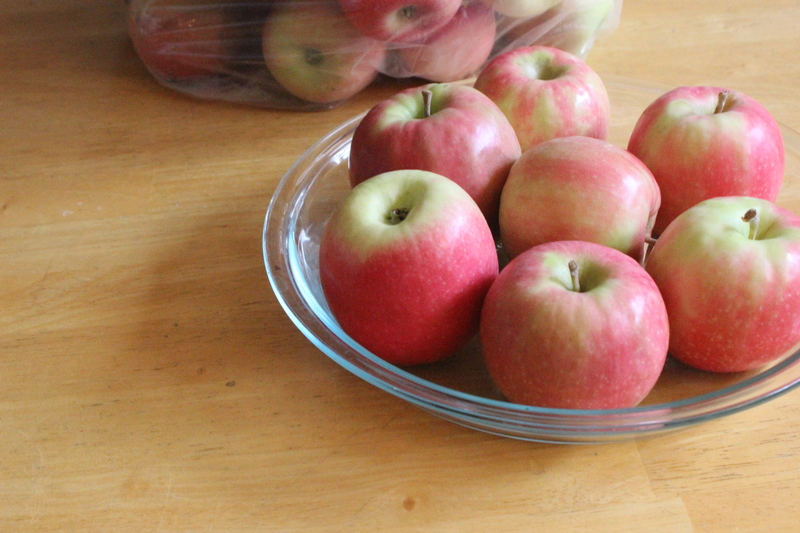 Also: you decide it’s time to go apple picking and bring home 32.8 pounds of apples. That’s right. 32.8 pounds. The nice lady only charged us for 32 pounds. Probably because she felt badly for my husband, who had to carry them, and who definitely was the smart one asking “do we really need another apple?” while my sister, sister-in-law, and I announced that we had found the perfect addition. We spent all of Sunday baking. We made only a very small dent. Expect more apples on the blog. 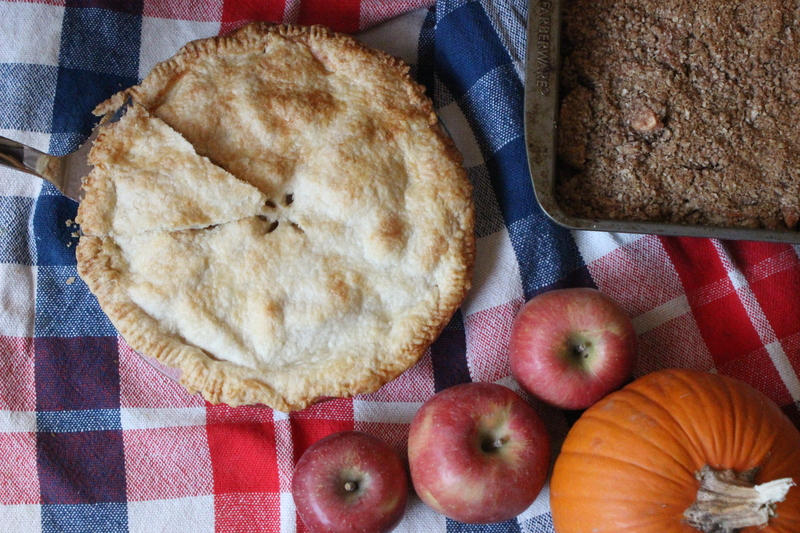 Make your pie crust. In the container of a food processor, combine flour, salt, and butter and pulse until mixed through (about 10 seconds). Place the mixture in a bowl and add the ice water, forming it into a ball (use more ice water if needed). Divide the ball in half (one for the top, one for the bottom) and place in the refrigerator for about 45 minutes. While the dough chills, peel, core, and slice your apples. In a large bowl, combine the sugar and spices, and add the apples. Add lemon juice and cornstarch and give the whole thing a good toss. Roll out both sets of dough. Kitchen God Mark Bittman recommends rolling the dough out between two sheets of saran wrap, and I couldn’t agree more. Makes the whole things less sticky, and less apt to stick to your rolling pin. Roll it out until it fits to your pie plate, and then carefully place it in (helps to put the plate over the dough and then flip it over.) Trim excess dough. Add the apples to the bottom of the plate and try to arrange them semi-neatly, so they cook relatively evenly. Dot with the little bits of butter (confession: we forgot this step & it was fine. There’s enough butter in the crust to go around.) Add the top crust and crimp the sides together. Now’s the time to preheat your oven to 450 degrees. Turning back to your pie, brush the top with milk and sprinkle with a little bit of sugar for some extra fun. Make a few small slits in the top of the pie, to allow steam to escape. Refrigerate until the oven is ready. Bake the pie on a cookie sheet (easier maneuverability) and cook at 450 for ten minutes. Turn down the heat and bake for 40 minutes at 350. Make whipped cream/buy ice cream/rejoice.